the observatori: The Road to Xueshan. Day 3. As our starting town today was too small to have taxis, we negotiated a shared ride to the highway (Dot Seven) with a local. 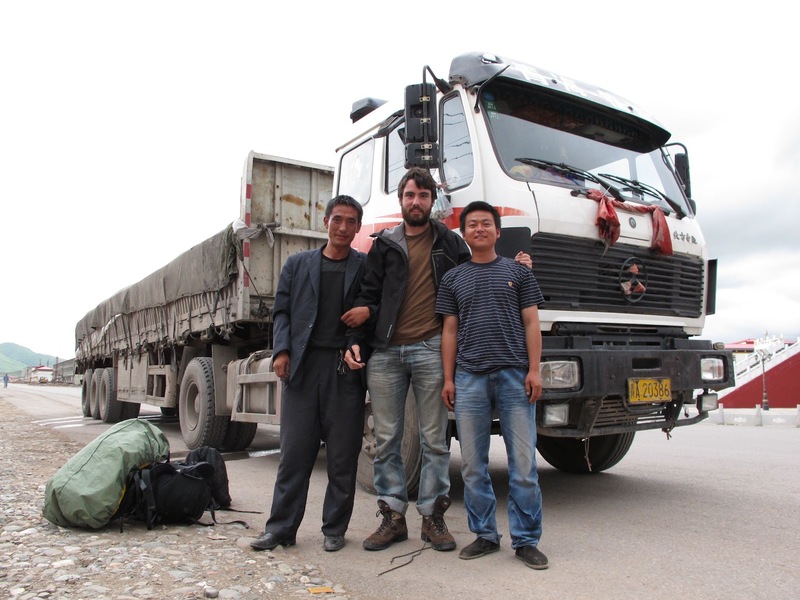 From there, a couple of friendly guys driving a gravel truck agreed to take us to Machen (Dot Eight). Considering the distance between dots seven and eight, it was a miracle to get the entire journey in one shot. 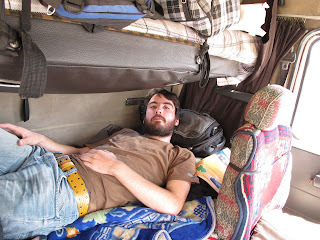 And, even better than that, we could do it in the comfort of the sleeper space in the truck. Easily the most enjoyable land ride that we've taken so far. 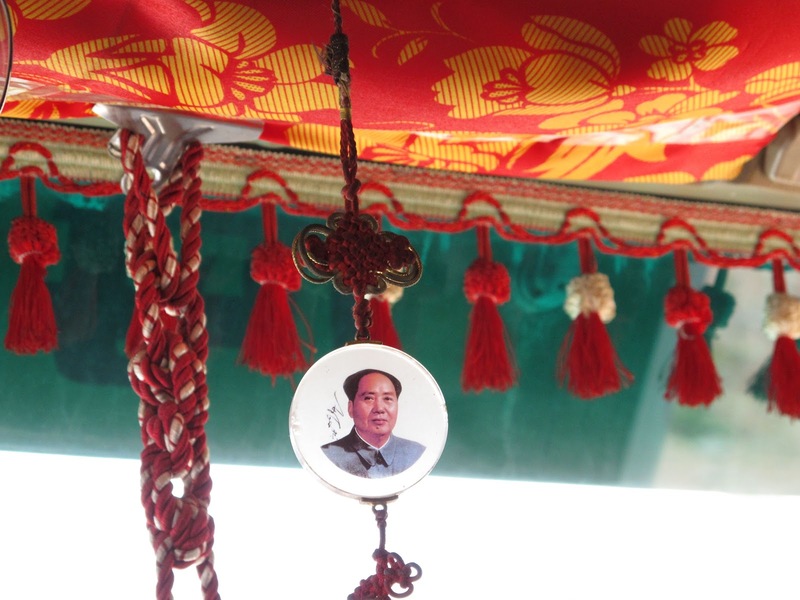 Listening to chinese music while an ornament featuring Mao's face swung back and forth as the truck bounced slowly along the road. These guys were well equipped for a long ride. 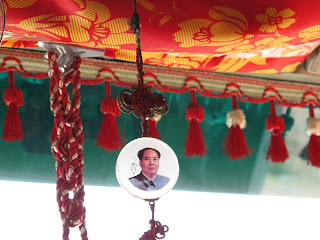 We snacked on plums and watermelon and watched yak herders on the mountains move their herds as we made our way over one mountain after another. We stopped for a bathroom and lunch break at a town about half way through the day. The town toilet system was essentially the same as we enjoyed last night, except that, this time, there were three large pigs sleeping in the corner of the concrete box. At that moment, I decided that it would be at least a few days until I would order pork again. I was soon reminded that, on this trip, not all of the decisions are mine. When I arrived at the restaurant, I discovered that the truck drivers had (very kindly) taken the liberty to order some lunch for us. First course: a gigantic plate of pig meat. And I didn't want to be rude. When we first climbed into the gravel truck, it was 8:00am and we imagined that we might get to Machen by 11:00am, potentially leaving time to get to Xueshan by dark. In the end, we rolled in some time after 7:30pm. Xueshan will have to wait another day.